My mouth waters at the anticipation of this dish. 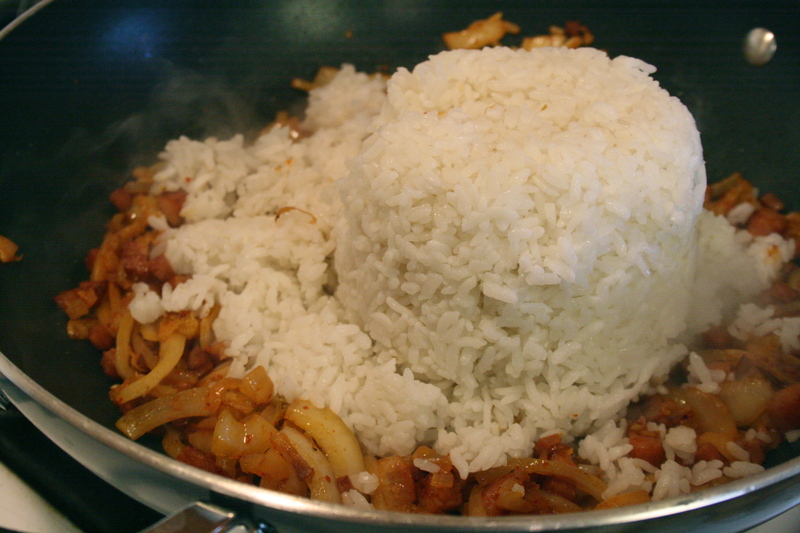 I remember the first time I watched my friend Ji-Young make it, I was shocked that she was using day old steamed rice out of the fridge and SPAM. Call me sheltered if you’d like but I don’t think I had ever tasted SPAM at that point in my life and didn’t quite know what to expect. 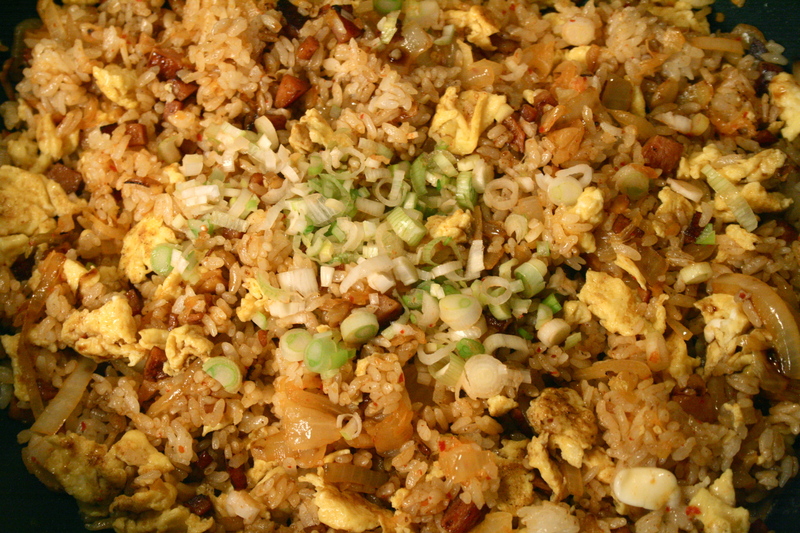 Actually I had never experienced kimchi in a fried rice either, so the results were going to enlighten my palate. As she prepared the rice she told me, “Whenever you add kimchi to a fried rice you must fry the rice in butter. If we were just adding meat and veggies we would fry in oil.” I shoved that tip in my pocket, took it home and deposited it in my memory bank. Finally the rice was done…… I dug my chopsticks in and never looked back. In my opinion this rice is one of the BEST side dishes you can place on the table. Thank you Miss Moon for introducing me to this delectable treat. I hope my version represents your special dish well. 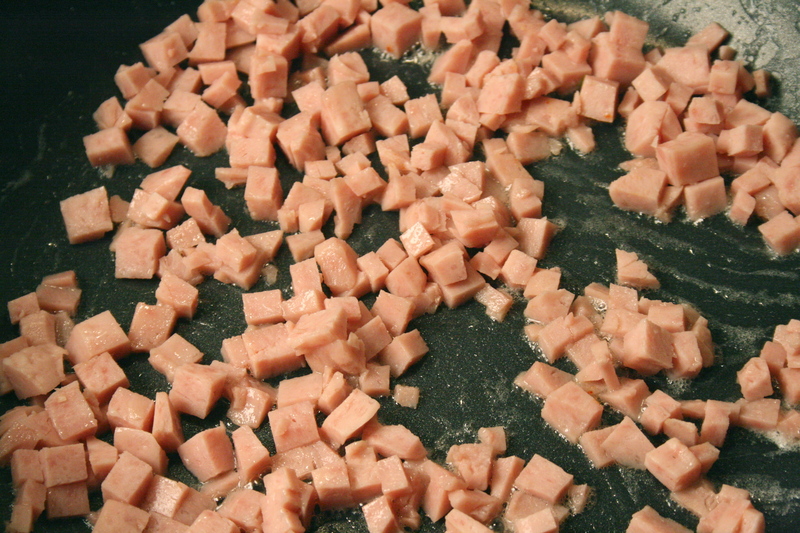 In a large frying pan over a medium high flame add 1 tablespoon butter and allow to melt then add cubed spam. Fry until spam is slightly crisp, about 5 minutes. 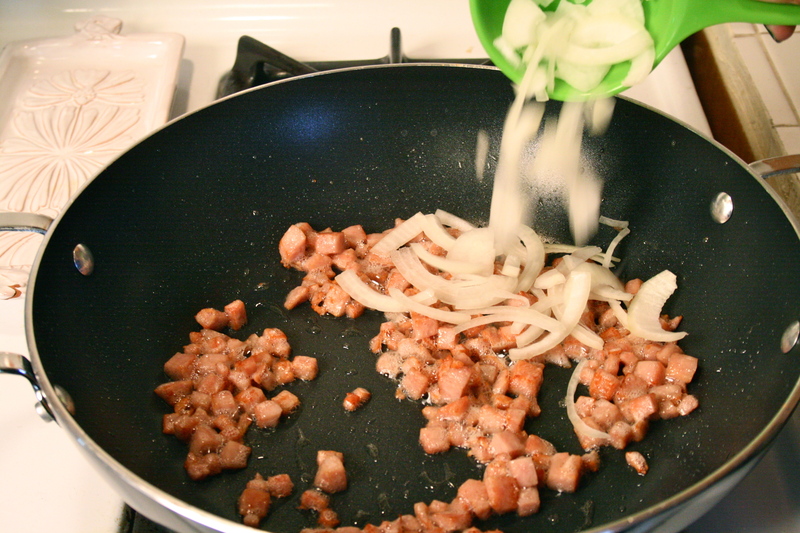 Then add in onion and mix well. Continue to fry for about 2 to 3 minutes. 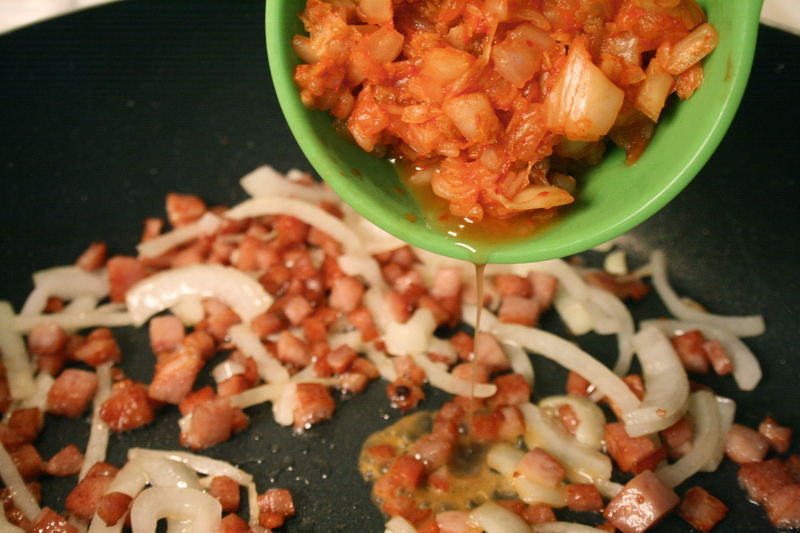 Next add in 2 tablespoons of butter and allow to melt into spam and onions, then add in chopped kimchi. Fry in pan for about 4 to 5 minutes. Once the kimchi and onions are nice and soft add the day old rice. It will take a second to break it up into the kimchi mixture. Mix well. Once the rice is combined lower the flame to a simmer. 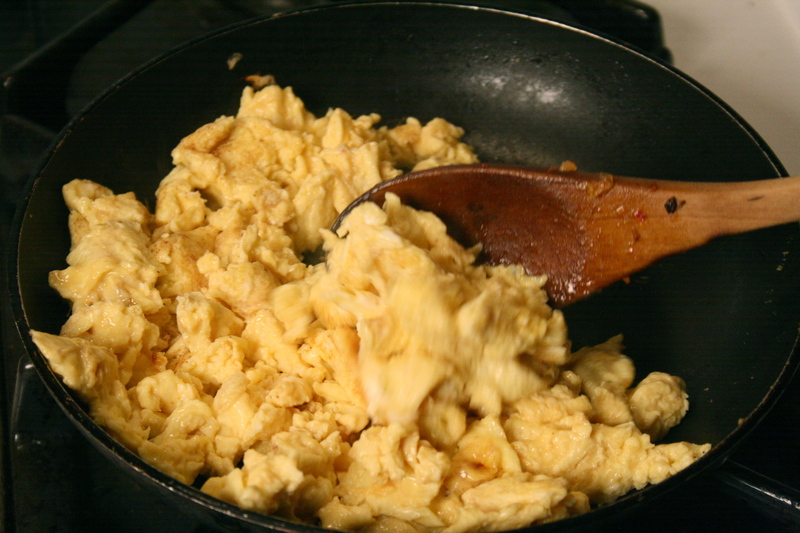 In a separate pan make some scrambled eggs then add to the rice, then top with green onion and soy sauce. Mix well. Lastly sprinkle with sesame seeds and serve HOT!!!!! Eat with a piece of meat or by it’s lonesome…. D-LISH! Looks delicious! Yummy. I can’t wait to try this recipe. Looks fabulous. Can anyone give me a kimchi tutorial? The couple times I’ve bought it, I’ve gotten stuff so spicy that no one in my house can eat it. Yum! I’m not sure if I’ve ever had kimchi, but I eat spam musubi from my local Hawaiian BBQ place and it is SO good. Spam and rice are a great combonation. I’ve never had kimchi or SPAM either! But it looks delish! I never had the desire to try either until reading your post and seeing it looks so good. Thank you for the step by step instructions and pictures (I need pictures!) on how to make it. Yummy! I LOVE kimchi, but I never would have thought to pair it with SPAM, of all things! Great idea (and I love your green nail polish!). 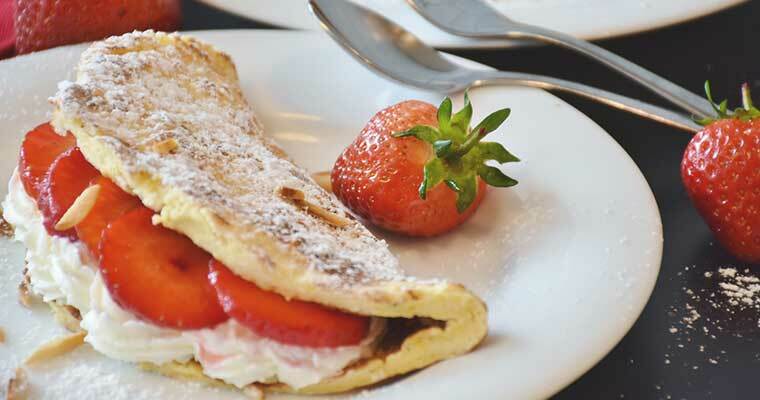 Very delicious!! I love any kind of recipes with rice! So good! I always wanted to cook something like this, now I have the perfect recipe. Thanks, Nicole! oooh I bet the Spam is super yummy! 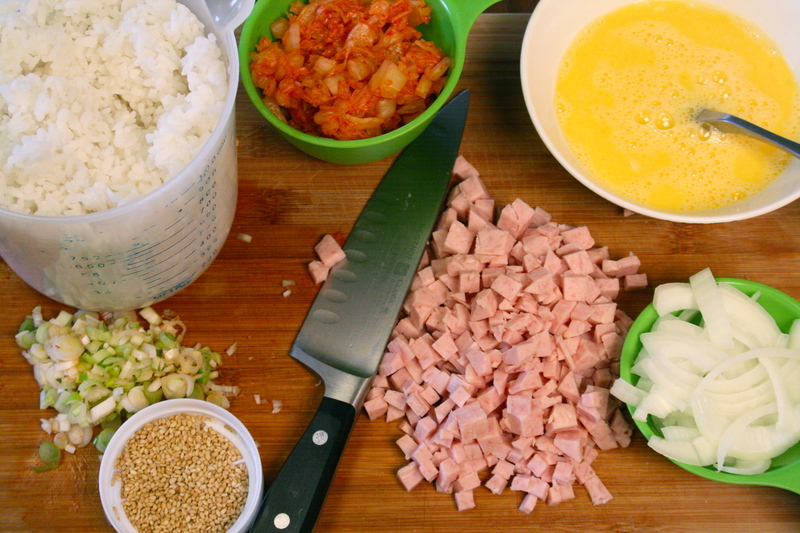 I usually just make chicken fried rice, I like the spam idea! Looks amazing! Love the idea of using kimchi, and thanks for the tip about frying it in butter. I prefer to fry things in butter anyway. Will try this without the meat. 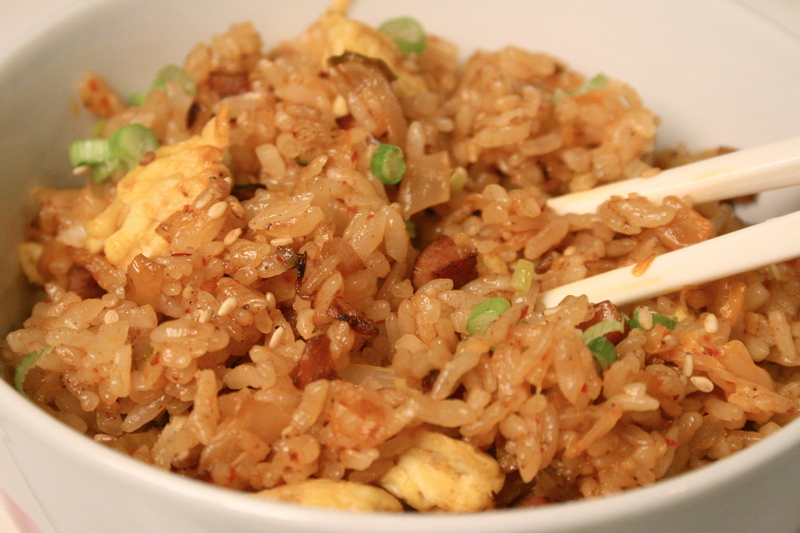 Love fried rice, definitely one of my favorite comfort foods. Really easy! 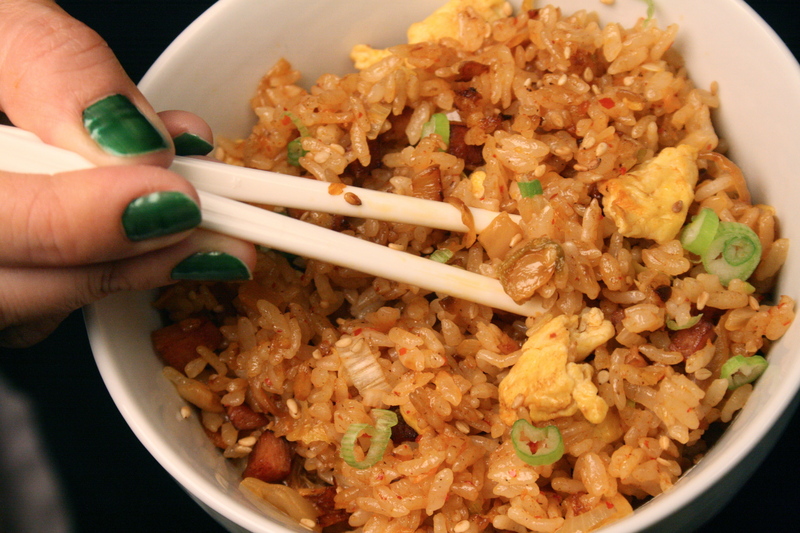 I never try to cook Fried rice because I though it was too complicated but You just changed my mind. Thank you! Will you marry me? Seriously, your recipes never disappoint! I want a bowl of this – extremely bad! It looks amazing. I’m going to be making it soon. I have a lonely can of Spam in the pantry just begging for it! Thanks for this great recipe! Just tried it yesterday using this recipe, just adding some peas and it tastes fantastic. It has become my favorite fried rice.